Everyone knows that Sri Lanka's test bowling attack has struggled since the retirement of Muralitharan. Sri Lanka is still in search for a bowling attack that can consistently pick up 20 wickets and win them test matches. Kanishka Balachandran over at Cricinfo talks about the promise that has been shown by Nuwan Kulasekara as Sri Lanka's pace spearhead for test matches. Kulasekara has been a sure starter in ODIs for a long time now, however his test appearances have not been as regular. He did well in the 1st test against Pakistan, but I have my doubts about whether he truly can be the bowler to fill the gaps in a bowling unit that has struggled in recent times. Doing well against Pakistan is not anything new for Kulasekara. His record suggests that he was probably born to do well against Pakistan. It is as if his sole purpose in life is to torment Pakistan batsmen. In 5 test matches against Pakistan, Kulasekara has 25 wickets at an average of 16.4 ! That is 25 of his 31 test wickets. How can a bowler who has only 6 wickets in 8 tests matches have 25 wickets in 5 matches against one opposition? Even his record against Pakistan in ODIs (22 wickets at 27.00) is decidedly superior to his overall ODI record (bowling average of 34). 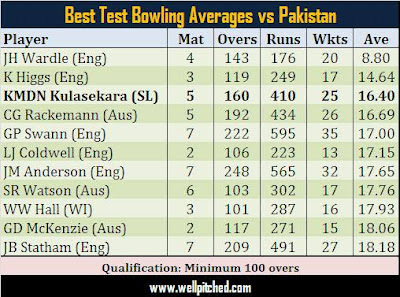 Kulasekara has the third best bowling average in the history of test cricket against Pakistan! He may be good, but we really make him look like the best. 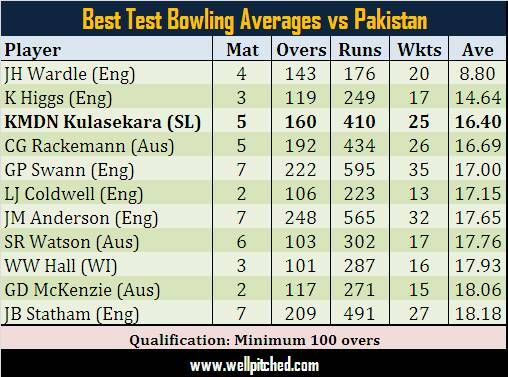 So when it comes to Pakistan, sure Nuwan Kulasekara is the answer to all of Sri Lanka's bowling woes. But for all other teams, Sri Lanka will definitely have to to dig deeper and find those match winners to replace the threat that used to be posed by Muttiah Muralitharan.